The original... the fuzzy blue guy in his first puzzle adventure. This game was conceived and created in 1999. It was completed in just over 2 weeks, and released as freeware. It has 25 levels, and is quite a challenge. The graphics aren't the prettiest (understatement), but the gameplay is fun. 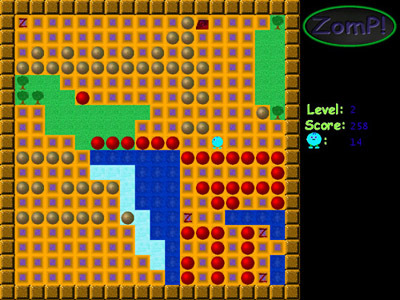 A favorite type of game of mine, Zomp holds a dear place in my heart. Released on April 29, 1999. Give the original Skelman Software game a try. It's free, and available on the download page. You can get it here.